When laundry became a public affair in college, I remember somehow managing to send suds gushing out of the machine I was using in my dorm’s laundry room, because I had forgotten than I had already loaded the drum with detergent and did so again. And I remember the nights I would study there, because the real study lounge was too stuffy and dim. I remember the roaring hum of the machine, which I’d sometimes lean against in its hot-and-heavy cycle if I couldn’t stay awake. The buzzing was comforting background music to a night of studying alone. I posted a photo on Instagram a few months ago from my first visit to my new laundromat with the following caption: “There aren’t any chairs at this laundromat. I guess I’ll just stand while they dance…” This isn’t true, I later discovered. Hidden, are three seats. The hard plastic kind that dip like a bowl, making you feel like your backside is the size of a tractor-trailer. It’s the least comfortable of the chair varieties, which is probably why most people don’t stick around. They’ll walk around and do some shopping as their wears flip and flop. But I never leave. I’ve tried. But I find myself wanting to sit there, yes, even in those god-awful chairs, and watch—watch as people come and go, and watch the dryer as colors move in a trippy spiral, and I try to pick out which articles I’m seeing. “Oh, I think that’s that pink pair of underwear, and that, well, that must be the tee-shirt I have in there; I hope the blueberry stains don’t bleed.” I never look forward to going, but I have come to find the hour or so incomparably peaceful. I’ve worn headphones in but they often come out; I’d rather listen closely to the hum. I’ve brought a book; I always put it down. I’ve brought work; my red pen rarely makes a mark. Those drums are distracting. The people are distracting. I’m happy for the mixed demographic. My neighborhood consists of a good amount of both young and old. There’s the woman who seems to own the small laundromat. I saw her cleaning the machines once in a pink-studded tube top with matching skin-tight jeans and strappy sandles with 6-inch heals. I looked down at my crummy shorts and cotton tee-shirt; I guess I was underdressed for the occasion. There’s the young guy with the Ikea laundry sac who seems to pick the same time as I do to wash (Sundays, 2pm). He’s a meticulous fold-er, so I imagine he’s probably a meticulous iron-er. There’s the old woman, so skinny and frail, in the tan knit skirt and the beige turtleneck. I’ve seen her twice. Both days were pushing 90 degrees. Both days she wore her turtleneck. There’s the 50- or 60-year-old man who looks, walks, talks, and acts just like Ed. He made me smile. And finally, there’s the guy in a Harley Davidson tee-shirt with whom I washed the other day, who sang Journey and Queen loudly and with no tonality over the booming country music that blasted through the radio’s speakers and asked me if I liked his voice. I smiled kindly, as he let out, “Don’t stop me now, I’m having such a…” No, please stop, I thought. But more distracting than the people are those machines. Or, really, my own mind, as it loses itself in the buzz. And as the clothes spin, I spin, usually absent of thought, sometimes remembering those pirouettes I did in my youth that were never quite as beautiful as those being done in that machine. I guess it’s a true Timothy Leary moment. Ok, maybe just the “drop out” part. Because in that hour, I’m completely detached. Detached from the chores that await me when I get home, detached from the commitments that will come pouring in come Monday, detached from the overthinking I’ve been prone to do, especially lately. I’m that little girl watching the clothes spin on the clothesline. I’m tracing the spiral and meditating to the sound. Just with other people. Publicly, not not privately. I like the spiral. It’s a controlled spiral with a rhythm that can be recorded and repeated. It’s a balancing spiral, when I feel like life is downspiraling. For some, going to the laundromat is probably just a utilitarian duty. It was for me at first. Some people, I imagine, think they’ll find true love with a stranger at the laundromat. While that would be nice, I’m really just there for the show. 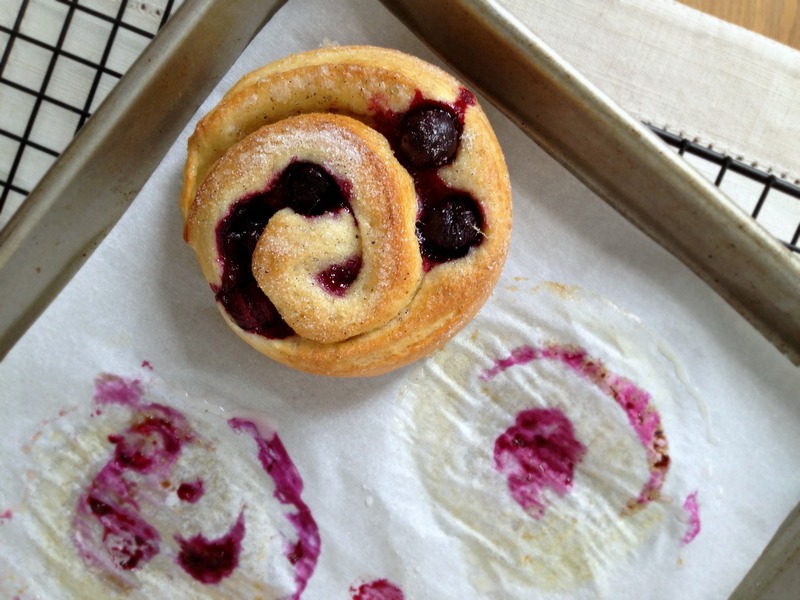 Like the spirals I trace over and over at the laundromat, these spiral buns—swirls I call them—go around and around and making them is just as soothing as a trip to the laundromat, because they involve kneading and rolling and folding and turning and tossing and all that I love to do. 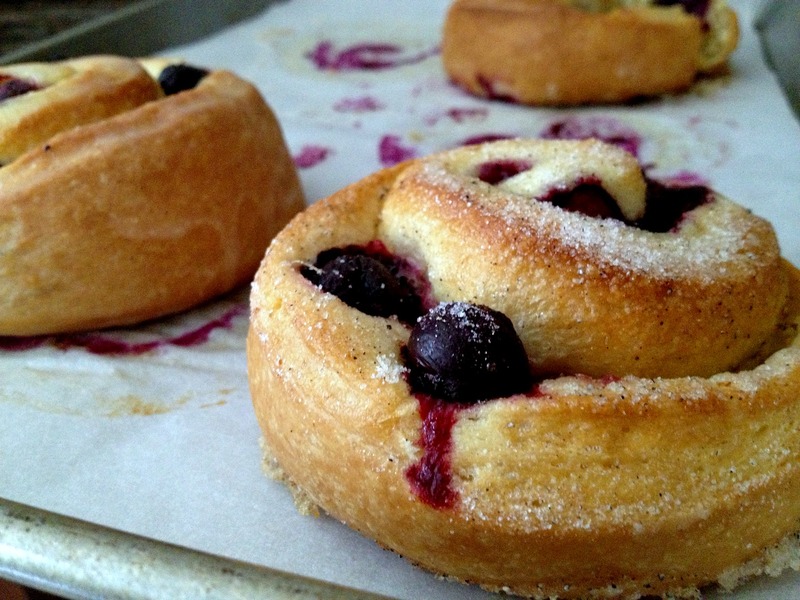 Cardamom and blueberry are a beautiful pairing if you haven’t tried them together before. The buns are not too sweet, but a pre-baking dusting of cardamom-sugar, which caramelizes slightly, or a post-baking coat (or two) of lemon-cardamom-yogurt glaze gives them pizzaz. And the colors bleed and the juice bursts and it’s summer bliss in a bun. And like summer, these buns last only so long, so they are best eaten soon after, if not right after, they’re baked. They are, in a much-overused word, heavenly. The brioche dough is adapted from Joanne Chang’s fabulous and foolproof version in her Flour cookbook. (It’s also in Flour, Too, a wonderful book for which I had the honor and privilege to test the recipes!) 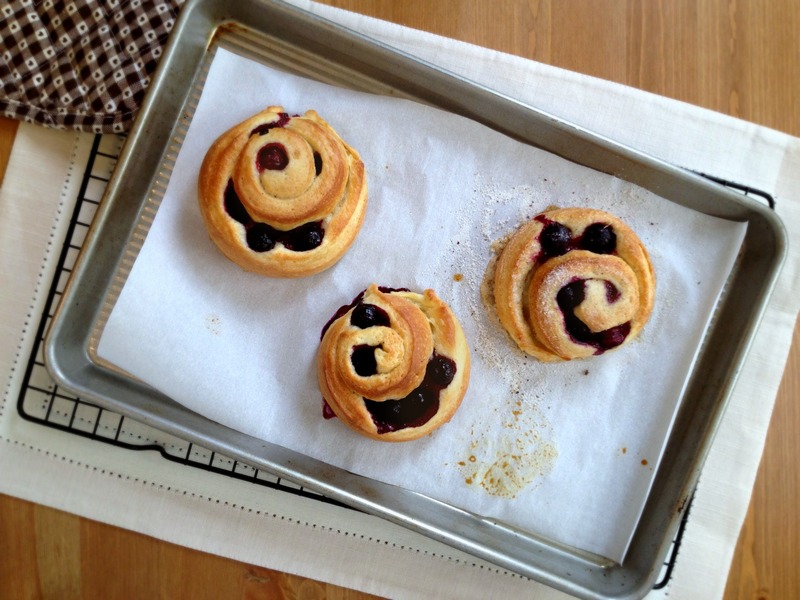 This recipe also borrows from her Pain aux Raisins–making method. The great thing about Joanne’s recipes is the conversational information about each stage and what the item you’re working with should look and feel like. I do not include these tidbits; you’ll have to buy the book for those. I love the original recipe (something you’ll also have to buy the book for) and the AP-flour/bread flour/butter ratio in it but have made a few tweaks to match how I typically make it. And I ran a little experiment with these buns. After fiddling with the yeast (and salt), I made a batch where I gave the shaped rolls an overnight fridge rest in addition to the bulk rest and compared them with the recipe using the traditional single retard. The dough was every bit as soft, full, and tender as the original version. So this recipe is flexible and storing/serving instructions and options are included. 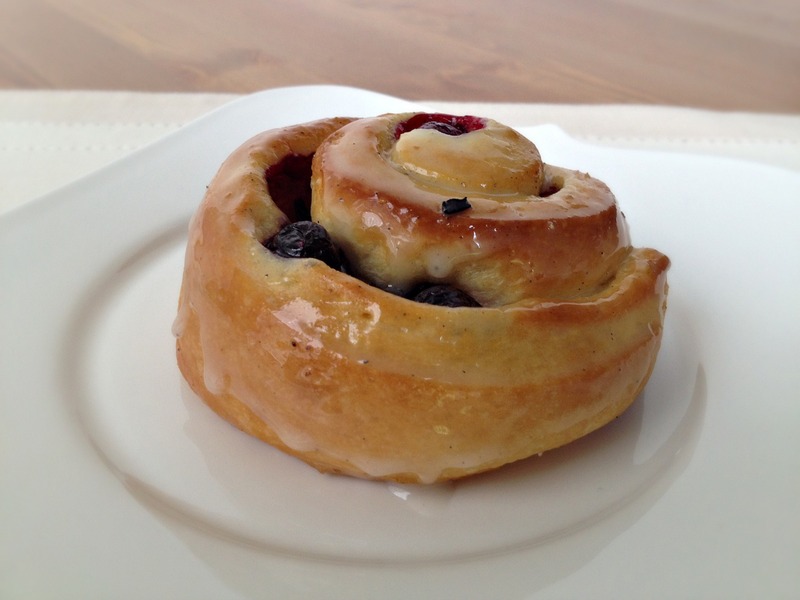 These buns are not as sweet as, say, a cinnamon roll; in the summer, I like the beautiful fruit to shine. They get extra sweetness from a sugar topping or glaze. Choose 1 (or make half and half). These buns are best when eaten warm. In bowl of stand mixer fitted with dough hook, mix flours, 80 grams (1/3 cup plus 1 tablespoon) sugar, yeast, and salt on low speed until combined, about 10 seconds. Add eggs and water and beat until ingredients come together into shaggy dough, 3 to 4 minutes, scraping down sides and bottom of bowl as needed. Continue beating for 3 minutes. Add butter, 1 piece at a time, mixing after each addition until butter disappears into dough. Once all butter is added, mix until butter is fully incorporated, about 10 minutes, scraping down sides and bottom of bowl as needed. Increase speed to medium and knead until dough becomes sticky, soft, and shiny, about 15 minutes. Increase speed to medium-high and beat for 1 minute until the dough feels smooth and is elastic. Transfer dough to large bowl or container and press plastic wrap directly against surface. 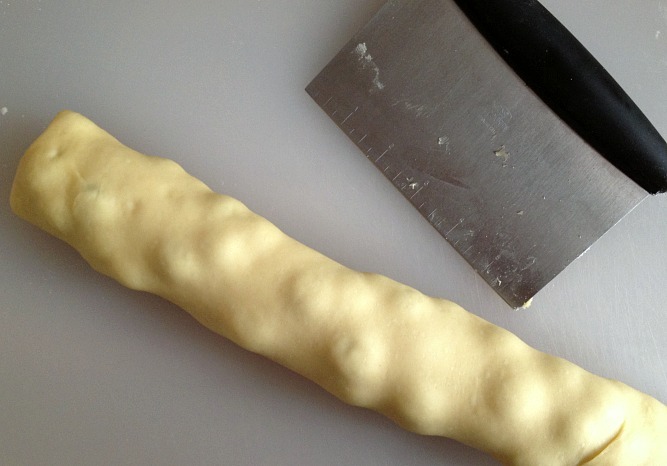 Let dough rise in refrigerator for at least 6 hours or up to 16 hours. 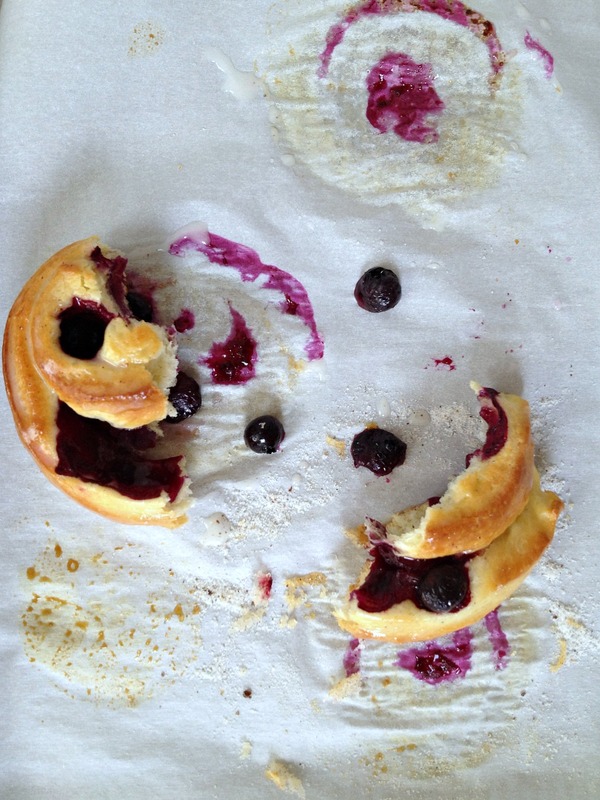 Space dough pieces evenly on prepared baking sheet, gently poke blueberries that want to pop out of buns, and cover buns lightly with plastic wrap. If proofing right away, let buns rise in warm place until dough is puffy, pillowy, and soft, and an indentation made with finger very slowly fills back in, about 2 hours. If proofing after an overnight rest, let rise in warm place for about 11/2 hours or until buns reach the above visual. If frozen, thaw buns in the refrigerator overnight and let rise in warm place for about 2 hours or until the buns reach the above visual. Adjust oven rack to middle position and heat oven to 350 degrees. Uncover buns; sprinkle evenly with Cardamom-Sugar, if using; and bake for 20 to 25 minutes or until golden brown on edges and pale brown in center and dough registers about 190 degrees. Brush warm buns with 1 light coat of Lemon-Cardamom-Yogurt Glaze, is using. If using glaze, let glazed buns sit for 15 minutes, brush with another light coat of glaze, and serve. Serve buns warm or within 4 hours of baking. 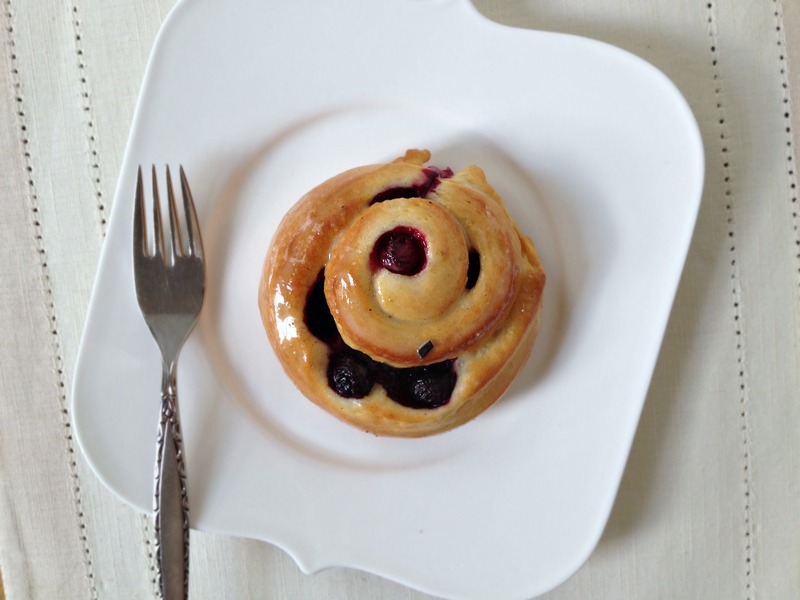 Leftover pastries can be stored at room temperature for up to 1 day but must be warmed before serving. Mix sugar and cardamom together in small bowl until combined. Whisk all ingredients together in a bowl until smooth. I love going to the laundrette! even on holiday, nowhere has better opportunities for people watching… once in Nice I watched a guy do his laundry, he came in (on rollerblades) skated to the machines, stripped to his boxers and skates, set his wash to start then skated out again. I’m so glad to know I’m not alone. I love stories like that! I have always had an affection for laundromats, too, for some unknown reason. (Though it was a happy day when I got my own washer and dryer at home.) But what swirls! One day I’ll get my own pair of machines and laugh at all of this nonsense :). It’s a labor of love (read: it takes time), but it’s easy and very rewarding. Go for it! I used to love going to the laundromat on cold Sunday afternoons. The heat from the dryers warmed me up as I read a book and watched people filter in and out. These rolls are just lovely (much like your words). Thank you for sharing with us! Ah, yes, the warmth. That’s another soothing thing about it. Thanks for reading! ooh, the cardamom sounds like such a fabulous addition!! i’ve never been to a laundromat, but i’m glad you’ve been able to enjoy the show :) probably makes it a little less mundane! Love cardamom and this combo.